"A group of saffron-robed monks chanted as officials crushed more than 300 elephant tusks in a seaside ceremony on Tuesday, as the new government of President Maithripala Sirisena sought to differentiate itself from its predecessor by sending a powerful message of intolerance for elephant poaching. Sri Lanka is the first South Asian nation to publicly destroy ivory obtained through elephant poaching and the 16th country in the world to destroy confiscated elephant tusks so that they cannot be traded in the black market. 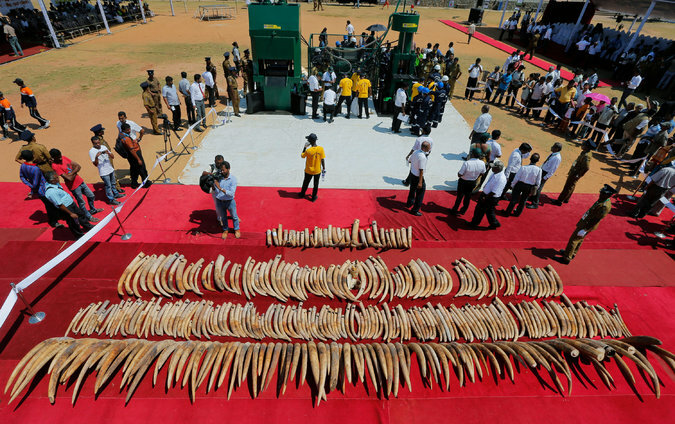 The previous Sri Lankan government, led by Mahinda Rajapaksa, had planned to distribute the tusks to Buddhist temples around the island, including the Sacred Temple of the Tooth, the country’s most revered. That spurred an outcry from Sri Lankan environmentalists and international wildlife agencies, who argued that the ivory would later be traded."